Here´s some background and rules I cooked up for the lesser daemons of Mhorrigot. If you have any ideas on how to improve these guys (points cost, are they too powerful etc. ), or have suggestions for the other daemons please leave a comment. I have tried to keep them balanced but would love some input! The Sickle-Kin are the dread executioners of Mhorrigot. They collect the souls of those who has given up on empathy and compassion and unwittingly turned themselves into servants of Mhorrigot. Sadly for his followers, patience is not his strong side and the Heartless One has no intention of waiting to claim these souls until the wrongdoers die of natural causes. The Sickle-Kin are there to speed up the process... They also act as his foot- (or rather float-) soldiers in times of strife. Truly horrifying to behold they have gaunt bodies covered in tattered robes with iron nails hammered straight into their shriveled flesh. Their tortured bodies have long since lost the ability to feel pain. Merged with a corpse-like appearance are disturbing insectile features - jointed secondary limbs jut out from their abdomen and beneath their sunken eyes mandibled mouthparts replace a human jaw. Lanky arms end in taloned hands grasping a large two-handed sickle with a wicked curved blade, so black it appears less a solid object than a tear in reality itself. They lack legs entirely and float in the air as if the ground itself is repelled by their very existence. 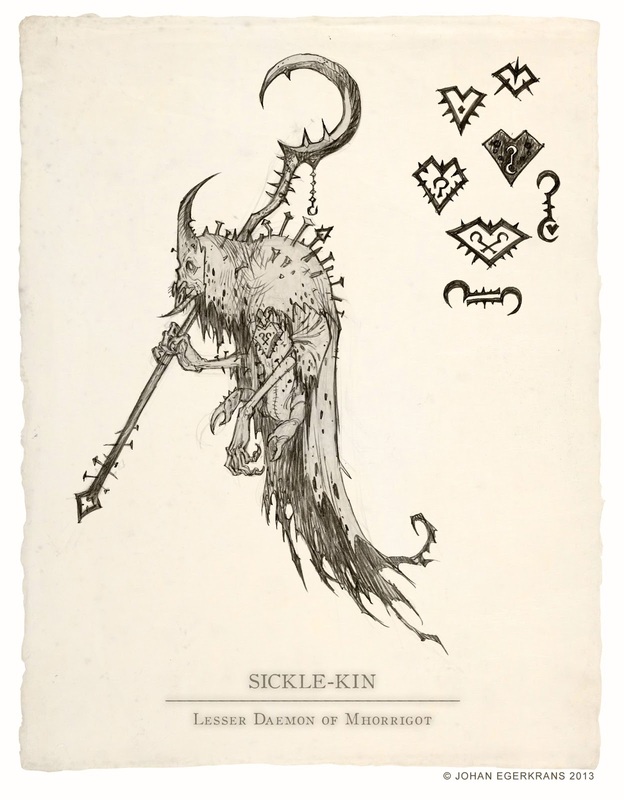 In spite of their gloomy countenance the sickle-kin have a surprisingly sprightly disposition. One of the lessons of Mhorrigot is that life shouldn´t be taken too seriously - especially not the lives of others - and his lesser daemons embrace this philosophy fully. The have a sarcastic sense of humor with tounges truly as sharp as their blades. In battle they constantly try to out-wit with each other coming up with sardonic one liners as they dispatch their prey. Mortal life is but a cosmic joke and they are there to deliver the punchline. Kindred Spirits: Sickle-Kin will never willingly attack or charge a Death Jester - they find a certain kinship in the Harlequin warriors dark, cynical, sense of humor. They will however fight back if attacked by one, but at -1 WS. 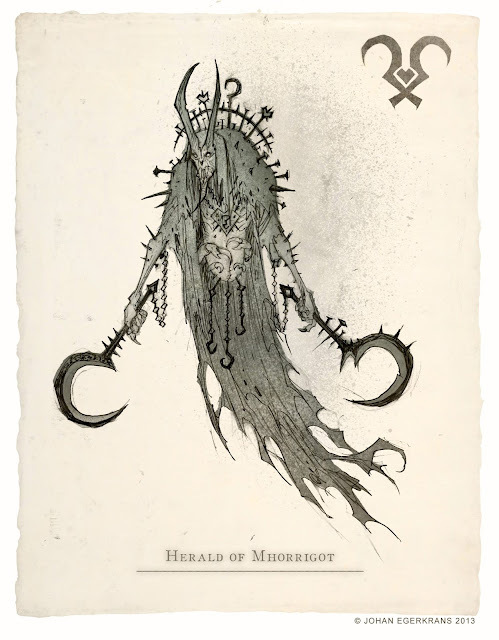 The heralds of Mhorrigot are the Sickle-Kin champions, tasked with collecting the vilest, most ruthless, souls and bring them screaming back to the Iron Citadel. Unlike their lesser brethren, who constantly gibber and exchange witticisms amongst each other, the Heralds are silent as the grave as they drift across the battlefield, twin Spiteblades in hand. SPECIAL RULES: Daemon of Mhorrigot (see below), Daemonic Instability, Deep strike, Fleet, Move through cover, Independent Character. PSYKER: A Herald ugraded to a psyker chooses its powers from the Biomancy and Telepathy disciplines. Daemon of Mhorrigot: Daemons of Mhorrigot have the Daemon, Hatred (daemons of Khorne and Slaanesh) and Feel no Pain (5+) special rules. Regarding the Sickle-Kin im kind of seeing them as emerging from nowhere, always just in the corner of your eye, with their insectile gurgling and laughter driffing across the battlefield, patiently stalking their prey until the moments right then suddenly appearing all around them leaving no hope of escape. Regarding the iron nails adorning your demons they coukd be a gift from Mhorrigot for a particularly valued soul, each one forged in the victims blood and freshly nailled into the demon that reaped them. Idomeneus over on the Ammobunker came up with the idea that the nails are made from iron collected from the blood of his followers. A normal human body contains about 5 grams of iron - enough to make a nail or two. I find that a really cool and rather grim concept and very fitting. The Shrouded Stalkers will have some hand in this retreival process. Loving the herald artwork, seriously its awesome fella, you have actually inspired me to start my own blog and post my own version of the 40k apocalypse. Imho it would be cool if instead of horns the herald had larger iron nails or rivets attached to its head. Forgive me for saying but the horns seem quite (chaotic) normal? Happy to be a source of inspiration! Send me a link to the blog if it's up! Not much to look at yet! Hopefully it will inspire me to paint more figures! Beautiful drawings! Thanks for sharing your stuff on a regular basis. It's always a pleasure to stop by and check it out. Thanks man! Right back at ya!